Umbwe route climbing guide. Duration: Six days, you spend the night in tents. To / from: Umbwe Gate (2100 meters) – Umbwe Cave (2940 m). Duration climb: 5 to 6 hours. Depending on your arrival, we leave early in the morning to Moshi to the entrance of the Umbwe Park, the ride takes you through several villages with great coffee and banana plantations. When Umbwe Gate draw the registry, and climb to the first camp. 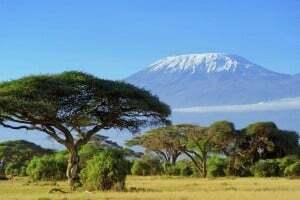 The tour takes you through the tropical rainforest at the foot of Mount Kilimanjaro, there can be seen a multitude of tropical birds, monkeys and other animals. Walk under more Lonzo along the river and the Umbwe river at the foot of these rivers are huge trees, the path is easy to follow, and the first climb is relatively easy. To / from: Umbwe Cave (2940 meters) – Barranco Camp (4000 meters). Duration climb: 6 to 7 hours. Setting: Tropical rainforest and Moorland (lunar). Shortly after leaving the camp, the woods are covered less dense, and moss grows on the trunks, the area is about following a more rocky area. The trail gets very steep, and you walk across a narrow path to the top. The view of Kilimanjaro here is very spectacular. If you Barranco Valley nearing the path becomes more passable, save your camp in the Valley at the foot of the Barranco Wall. By the nightfall you will see a very spectacular sunset here. If you have inserted an extra acclimatization (which is recommended), then you stay here a day longer. From / to Barranco Camp (4000 meters) – Lava Tower (4600 meter). After breakfast you walk towards the Lava Tower, a known point on Mount Kilimanjaro. The trail is steep and there are many rocks, you have a good view of Mount Meru, which are top pierces through the clouds. From / to Lava Tower (4600 meters) – Arrow Glacier Camp (4800 meters). Surroundings: Rock / stone, snow / ice fields. After breakfast, take the path for the Western Breach, a steep climb to the Arrow Glacier Camp. The first symptoms of altitude sickness are palpable, the camp is spectacular, with huge rock walls. From / to Arrow Glacier Camp (4800 meters) – Uhuru Peak (5895 m, top) – Mweka Camp (2800 meters). 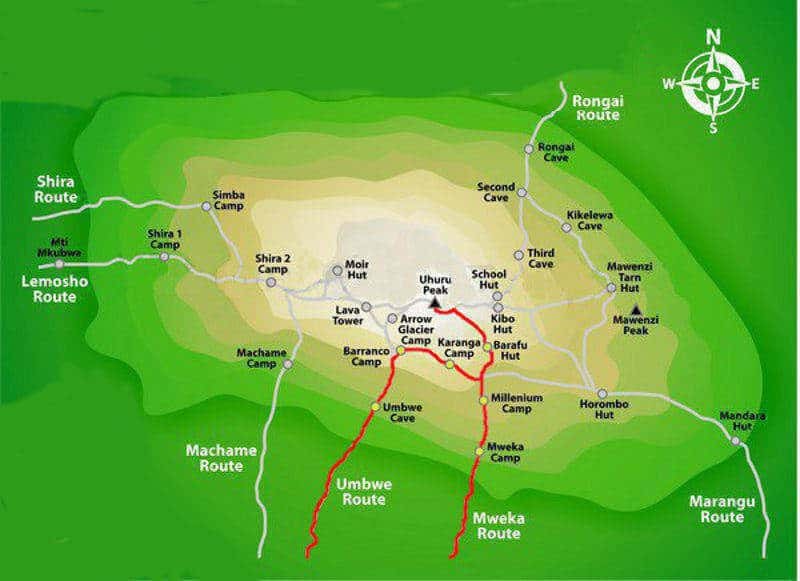 Duration: Arrow Glacier – Uhuru Peak 6 to 7 hours, Uhuru Peak – Mweka Camp 5 to 6 hours. You leave in the middle of the night, about twelve o’clock, first climbs Gilmans Point to see an unforgettable sunrise here, then climb to Uhuru Peak (top), and then you drop back to Mweka Hut, where you will no doubt exhausted, but satisfied to enjoy your sleep. This is by far the hardest part of the climb. After a hearty breakfast, walk to the Mweka Gate, where you write your name and other details in a register, hereafter you will be brought in Moshi or Arusha to your hotel. Getting to Mount Kilimanjaro, and back to Arusha.